We can be contacted by e-mail on info@yin4yang.com or by telephone on +32/476/708 232. 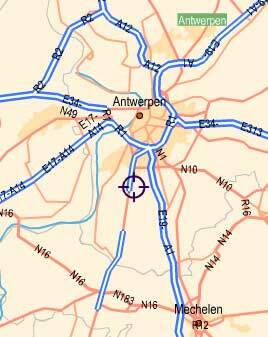 Take the exit towards the A12, direction Brussel/Boom. Follow A12 direction Boom, you will go through a tunnel and pass over a viaduct. At the end of this viaduct, you have to keep right. This will automatically lead you to the outer road at the end of the viaduct. At the first traffic lights, go straight ahead, and at the second traffic lights, turn to the right. Follow this road for one to two kilometers. At the first traffic lights, continue straight ahead. Also straight ahead at the next 2 traffic lights. Now you will arrive at a train crossing. Turn to your left immediatly after the train crossing. After a few hundred metres, you will again see traffic lights. Turn to your left. Follow this road (Provinciale Steenweg) for about a kilometer. At that point the 'main' road will make a 90 degree turn to the right, but you can also go straight ahead into the town center. Follow the road ahead into the center. After about 200 meters, take the first street to your left. This road will pass under a railroad bridge. Here you have a street straight ahead, and one that turns to the left. Go left. At this point, the Stuyvenbergstraat starts. You need to be in the 3rd house on the right, with a round window and a grey front.